Change default format for screen captures. Is there a better alternative to Screen Capture Format? Is Screen Capture Format really the best app in Desktop category? Will Screen Capture Format work good on macOS 10.13.4? 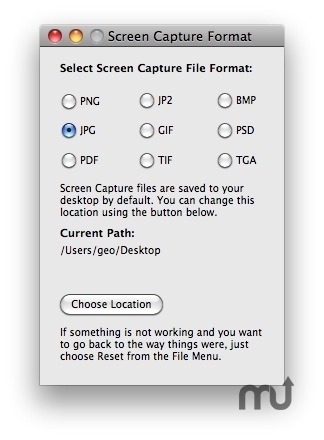 Screen Capture Format is a utility designed to get round one particular problem facing many Mac users: the default file format for a Screen Capture [Screen shot] on Mac OS X Snow Leopard is .png and the default location to save it, is on your desktop. But what if you want another format or you want to save the files somewhere else by default? Do you have to open an image editor to change the format then manually drag the files to another location? Do you have to edit system files using the Terminal? Well - no more, because this is where our new Screen Capture Format utility comes in! Added the path to the save location. Screen Capture Format needs a rating. Be the first to rate this app and get the discussion started! Once you install this little application, you can easily change your default format to any one of nine different formats and you can change your default save location with just a click of a button. Once you've made your selections, you can quit Screen Capture Format and your Mac will use your choices as the defaults until you want to change them again. We have also included a Reset option should you want to quickly return to the out-of-the-box settings.